Looks like a 2 for 1 end of turn gamble for the low low cost of all your mana. So high cost for a meh effect, don't will see play .. It is good with minions that cheat out bigger minions. Duel! and Muckmorpher comes to mind. 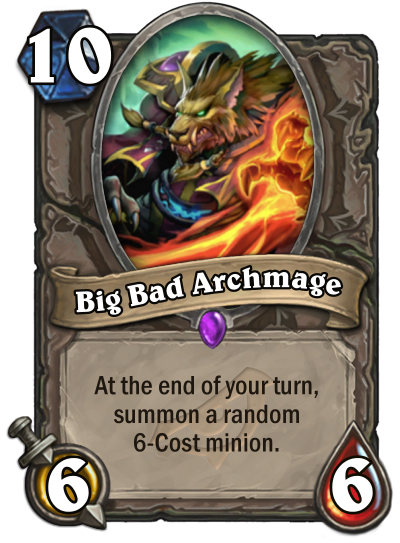 its really "big BAD archmage"
Good with Boomship? Dunno, seems pretty bad with the end of turn synergy leaving. How do I already have a "Bad" vote on it? I didn't even click on it. Oh well, it's still my opinion of it anyway. Together with warrior's scheme, the worst card so far. Each expansion has had a card that the majority of players think that it's trash, but turns out the card is OP in some form. I believe that this card is going to be this expansions trash card that turns out to be OP. Even if you cheat it, then what? You get arcanosaur?! The name is cute... but that's the only thing it's got going for it. Not great but at least has some meme potential with cards like Kobold Illusionist. Ok. So draw these with cloning gallery plus one spirit of the dead for 10 mana. Also tech rocket launcher into your deck so it kills them at the end of the turn. draw both out with Bwonsamdi and play both for a 9 mana combo. So you get these, two 6 mana cards and bwonsamdi on deck for 9 mana. Definetly not sleeping on this one. Muckmorpher and such.might make this strong. Not too sure about this one. The effect is interesting but the cost is a bummer, and even if you manage to cheat it out, it still feels lackluster.